RFU launches Every Voice Counts campaign to give fans the chance to be part of a new recording of Swing Low, Sweet Chariot. 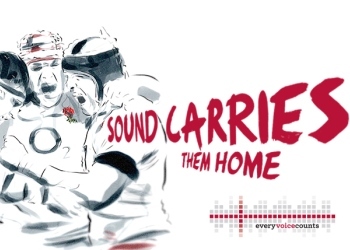 The Rugby Football Union (RFU) has launched its Every Voice Counts campaign asking fans to feature on a new recording of Swing Low, Sweet Chariot, which will be the official England Rugby single in 2015. Swing Low, Sweet Chariot has become the unofficial anthem of the England Rugby team and the Every Voice Counts campaign sets out to find voices from up and down the land to come together to help carry the England team home in 2015. From today people can be part of the movement by going to England Rugby’s Facebook page to record or upload their renditions of the chorus to Swing Low, Sweet Chariot, or through Instagram by submitting their rendition and hashtagging their entry with #carrythemhome. Lending a voice to support England is the only criteria to take part, you don’t need to know the difference between a flanker and a fly half to join the nation’s choir and get behind the team. It will only take a couple of minutes to record your rendition, which can be seen on the England Rugby Facebook page and everyone has the chance to play a part in the eventual single, which will be launched in September 2015. The RFU is also inviting rugby clubs, schools, universities, businesses and supporters at Twickenham on match days to record their renditions. The RFU has launched the unique campaign in conjunction with Facebook. Swing Low, Sweet Chariot is a song that has been long associated with rugby fans at grassroots level for generations. The song is regularly sung at England Rugby matches by supporters and the England Rugby team returned from the 2003 World Cup victory in Australia on a plane dubbed “Sweet Chariot”.